This month's challenge was again something I had never tried baking before. I'm growing to love bread making so it was another very welcome challenge! 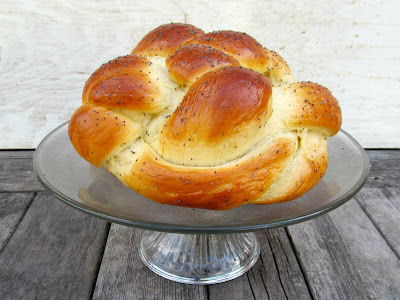 May’s Daring Bakers Challenge was pretty twisted – Ruth from The Crafts of Mommyhood challenged us to make challah! Using recipes from all over, and tips from “A Taste of Challah,” by Tamar Ansh, she encouraged us to bake beautifully braided breads. I made 3 loaves of challah this month. The first pictured above is a blueberry cheesecake challah shaped in a spiral loaf. The second dough I made was lemon poppy seed. I shaped a round braided loaf and attempted to make a six strand braided ring- but as you can see below -not my best work! But the lemony bread was really delicious and as you can imagine, the blueberry cheesecake was completely awesome. 6 stranded braids are kinda hard to make! I tried to follow a fancy method I found on you-tube. But lost my way many times and ended up sort of slapping it together. If you're a beginner, I would recommend trying the woven round loaf. That one is pretty easy. 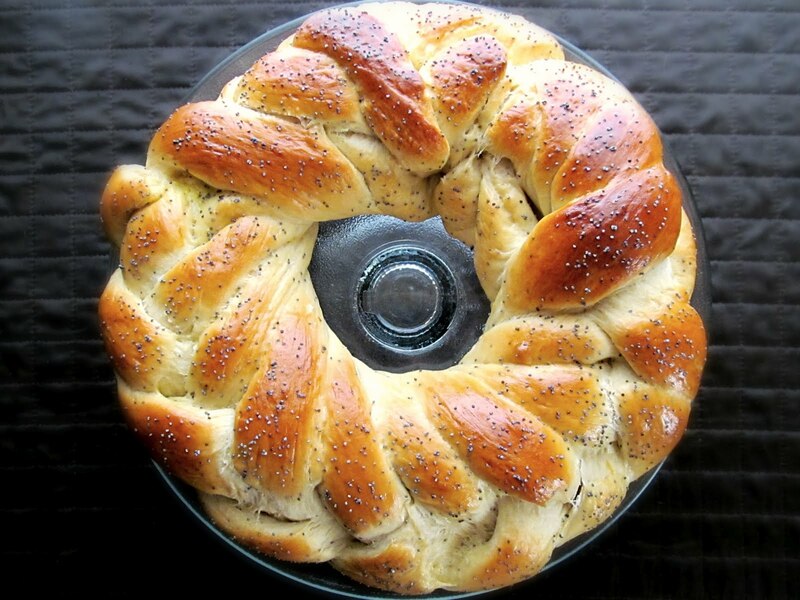 If you look up tips for braiding challah on the internet you will find a bunch of really good tutorials in a minute. I followed Ruth's recipes for whole wheat challah and honey white challah, but changed them up a bit for my challah breads. You can find the original PDF here for Ruth's recipes. 1. In a bowl, dissolve yeast in warm water. Allow to stand about 5 minutes until foamy. 2. Combine eggs, sugar and cream cheese with yeast mixture until mixed (it will be a little chunky). Add flour, salt and oats and mix until it all comes together. 3. Turn onto a well floured counter and knead for 10 minutes until smooth and elastic, adding flour as needed until the dough doesn't stick to your hands. 4. Form dough into a round, compact ball. Turn into an oiled bowl and cover with a kitchen towel. Let rise in warm area (I put it in the oven with the light on) until doubled, approx. 2 hours. 5. Once dough has doubled, punch down. Recover with towel, allow to rise again for 30 to 60 minutes. 6. Punch the dough down again and roll on a lightly floured counter into a large rectangle about a half inch thick. Spread the blueberries onto the dough and roll up in a tight spiral like you would when making cinnamon rolls. Roll the long log shape under your hands to tighten it, even it out, and thin it out just a bit. 7. Shape into a spiral by rolling up like a snail shell starting on one end. Keep it straight and even as you roll, turning the spiral onto its side when done and tucking the end under the loaf. Place the shaped loaf onto a parchment covered baking tray and go over the dough with your egg wash. Cover with the towel and allow to rise for several hours in the oven with the light on. This step takes a while because your blueberries are cold. You want them to thaw so your bread will bake all the way through. 9. Brush loaves with another egg wash.
10. Bake 40 to 60 min. until the loaf sounds hollow when tapped on the bottom or even better, when the internal temperature of your loaf is 190F 205-210F . When the top has reached your desired color, cover the loaf with foil for the remainder of the baking time. 11. Transfer bread to a wire rack to cool before serving. 1. In large mixing bowl combine ½ cup warm water, 1 Tbsp. sugar and 2 Tbsp. yeast. Allow to proof approximately 5 minutes until foamy. 2. To the yeast mixture add the lemon juice and zest, honey, oil, eggs, salt, 5 cups of flour and poppy seeds. Knead on a well floured counter for about 10 minutes until smooth, adding flour as needed until the dough doesn't stick to your hands. 3. Transfer dough to a clean, oiled bowl, turn to coat or add a bit more oil on top. Cover bowl with a kitchen towel. Leave to rise in a warm place until doubled, about 1 ½ hours. 4. Punch down the dough, divide it into two sections. Use one half to make each loaf (shaped or braided as desired on a lightly floured counter). 5. Place loaves on parchment lined or greased baking sheets and go over the dough with your egg wash. Cover with a towel, allow to rise 30 minutes. 7. Brush loaves with another egg wash and sprinkle with poppy seeds. 8. Bake loaves 30-40 minutes until done. Beautiful job! I love the braided ring! 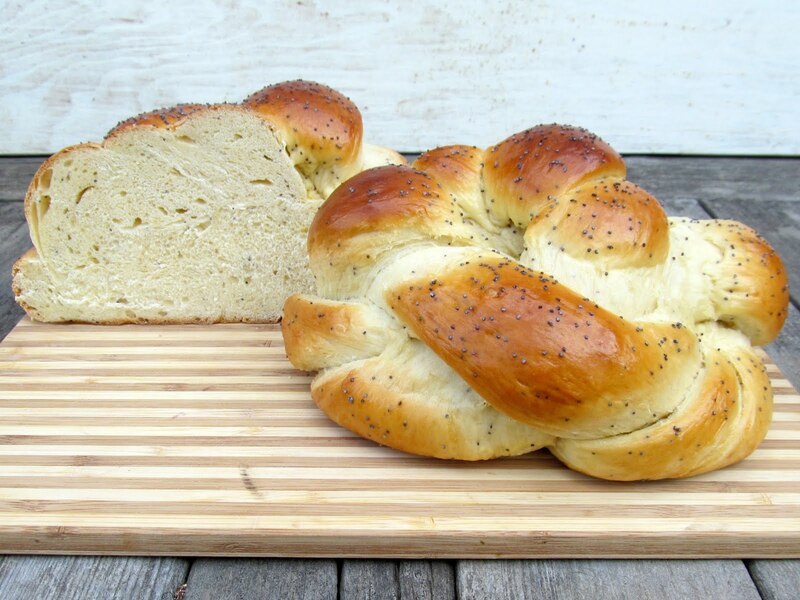 And both blueberry cheesecake and lemon poppy seed sounds wonderful, I never would have thought to do either of those flavors in challah, but I bet they were awesome! Thank you for the largely undeserved praise for my braided ring :) Luckily the super lemony flavor made up for what it lacks in appearance! I love your recipes and ideas! 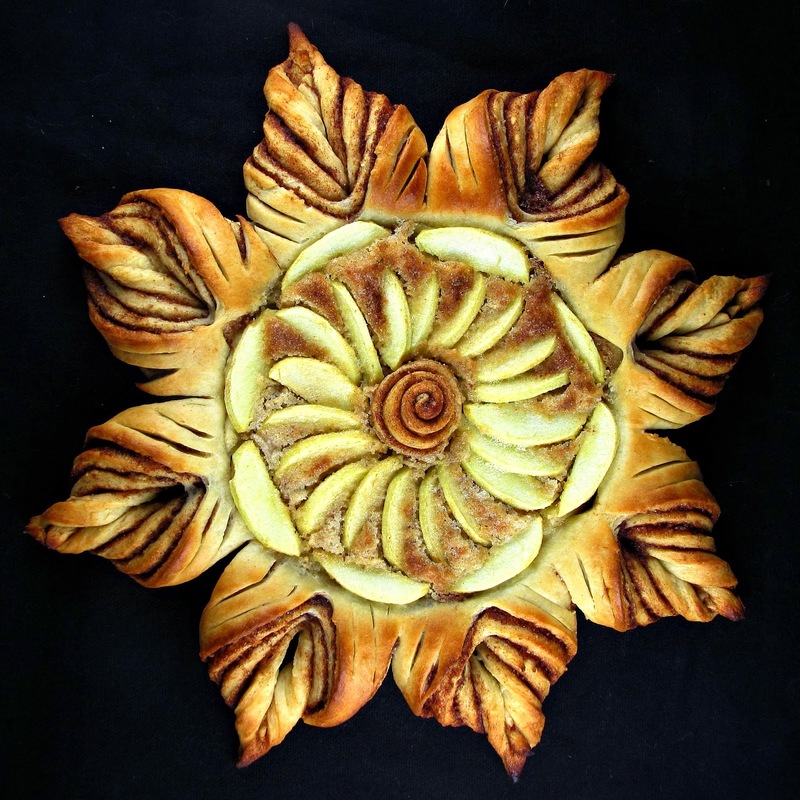 In fact, I loved the look of your spiral loaf so well, I made one of mine into a spiral as well. 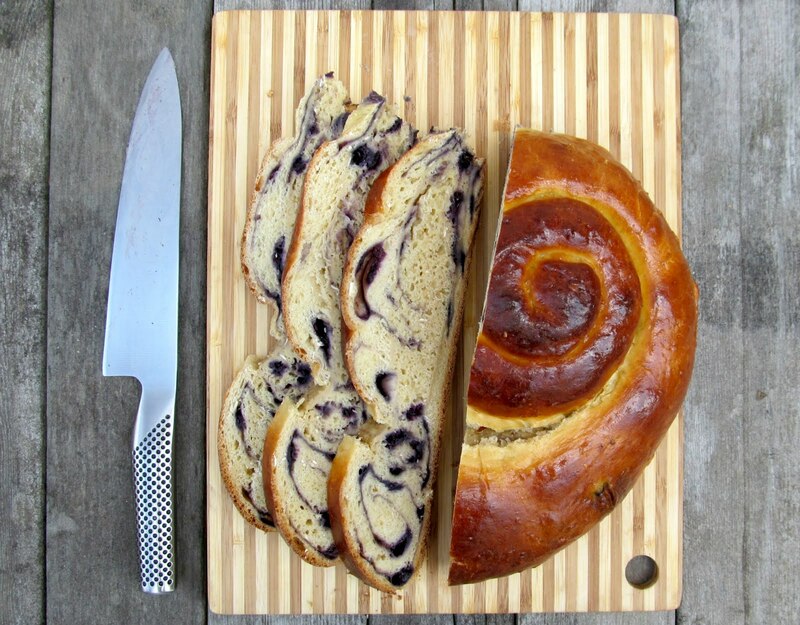 I'm going to have the try the blueberry cheeesecake challah as well. It sounds divine and looks so beautiful! Hannah, I think these are the prettiest and most creative challot I have seen this month. So beautiful! I love the look of the blueberry cheesecake one, and the lemon-poppy seed version sounds like the very best kind of loaf cake. Amazing job this month! Now those are some unusual combinations...... Great work.... Can't wait to try the Lemony Bread !! Keep in touch.... Cheers !! The blueberry filling looks so pretty! Nice job. Love, love love your challot! That blueberry cheesecake... SO want that one! Your braids look great, and I am so glad that you had fun! It was really a pleasure and honor to bake with you this month! Thanks Ruth! You were a wonderful host! I love the creativity you showed in your 2 different flavor versions!! Yum! !